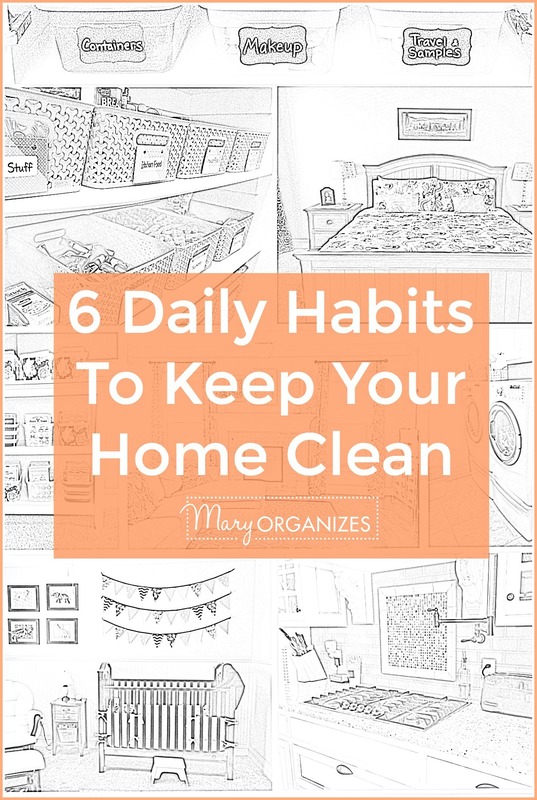 I have 6 Daily Habits that will Keep Your Home Clean. The good thing about this list is that these aren’t hard or time consuming. I have a lot of other things I want to do with my time besides clean – how about you? These habits will make the biggest difference in making your home feel clean. If you have to choose between these or your Cleaning Routine on any given day, do these first. These are the key to making everything else work. Doing a little cleaning and a little laundry every day goes a long way! Don’t wait for the build-up, just do what you can! Basically – A Cleaning Schedule is where you choose a day to vacuum or a day to dust or a day to clean the bathrooms, and then you stick to those days each week to clean those things. Fore more info, read: How To Have A Perfectly Clean House All The Time … or something like that. Make it a family habit that after dinner everyone stays in the kitchen until it’s clean. This makes the rest of the night go so much more smoothly – you will wonder why you were not doing this all along. Do you ever put the kids to bed and then look at the dirty kitchen overwhelmed and exhausted? Many hands make the job go much faster. Have everyone help as soon as they stand up from the dinner table. If your children are still young, start this habit now and you will always be glad you did! One of the most common complaints I hear (and help clients deal with) is paper clutter. Piles of paper are a huge problem, but with some simple daily habits (and I mean SIMPLE), this problem can be solved forever. The quick summary is that you pile mail and papers in your inbox all week long unless something is urgent, then you make make a weekly appointment with yourself to sit down and go through it all at once. It takes a lot less time to go through it at once like this than to nickel and dime your time all week. What I see happen sometimes with clients is they will try this, but doubt themselves, so they will start forming piles around their inbox of “urgent” things, thereby guaranteeing that they make their inbox obsolete and proving their fear correct. Go all in. Trust the system and don’t self-sabotage. If you have kids, your home is going to get messier. I have good news, if you have kids and your home is messier, you also have kids that can also help you clean it! Of course, to get to the point where children’s help is helpful, it requires a lot of time with the parent training. Start off with adjusted expectations, but you have to start somewhere. There are difficult moments, but it is so hard. I have so much to say about this topic that I have updated my main blog post about Kids Chores. At our house, the kitchen garbage goes out every day whether it is full or not. Other garbages go out when they are full. When the system works perfectly: the children are supposed to notice when they do their daily chores. Our children”tidy” different areas of the house as part of their chores, and I explain to them that “tidying” includes checking to see if the garbage needs to be changed. In reality: I notice when the garbage is full and then remind the child responsible for that area when they are working on their chores that day. Either way, the little garbages around the house get changed and it isn’t that big of a deal. Was disappointed your book wasn’t hard cover or soft, because I have yet to download it! Don’t use computer often enough to keep it active!!! Am working on it! (Use iPad lots), but don’t print from it. Maybe that’s what I need to learn! Which book do you mean, Jan? Can you email me mary@maryorganizes.com? I may be able to help. I craft, meaning I crochet, sew, make jewelry, cross-stitch etc. I love it all. And I love craft magazines. I have patterns galore in these magazines. But as you can guess all this is very cluttering. Suggestions on taming all this? Are you trying to collect a library/archive of information? If so, you should get shelves and magazine holders and organize by what makes the most sense – craft type, project type, magazine type, etc. If you are just trying to keep what you’ll really use and need, I recommend donating or selling the books/patterns after you’ve used them. Can you scan the articles that interest you and save them on pinterest? Then you don’t have to keep the magazines laying around and others can enjoy your findings. This worries me a bit due to copyright laws – be careful! I place the pattern in a notebook sleeve and in a labelled notebook by type. Think about their ages … and expect them to help about that many minutes at a time with breaks in between. But, you should be able to get them to work that long. So, incentives, discipline, alpha-mom, you can do it!!! My kids definitely don’t deserve a reward for normal routine stuff, but if I need their help in a pinch, that is when I throw out the incentives. And for young children, I present regular stuff as the incentive … like, after we do this, then we can do play-doh, etc. You are doing great! Being a mom is hard and there are many moments we feel like we are failing, but if we are trying, we aren’t failing!!! Just keep on swimming! I like what May replied. It may not be a real incentive, as in something extra, but to say “if we all pitch in and do this super tidy, we’ll have time for mommy to read a bedtime story, or watch a movie, or play a game, or whatever, before bed. Show them how you will have more time for them if they just spend a few minutes doing this super tidy before bedtime. It can even be a game to see which kid gets more done. Competition can be a good motivator and make it more like a game than work. Definitely have fun with it; don’t make it work. Kids will be more likely to do it if it is presented as a game than if it is presented as work. Hide a reward, like a card that says special one-on-one time or an ice-cream treat or whatever appeals to your kids, and whoever finds that card can cash it in sometime in the next week if you don’t have time to do something with them that night. I get my grandson to do it pretty easy most nights. I let him pick out the music to play, the TV goes off, and we clean for 10 minutes. I stay in the same area, and then we are doing it together, singing, dancing, and cleaning. It’s got to be fun. LOL. You can do this if I can!